Dr. Kurian Zachariah (Editor), Dr. Koustubh Chakraborty and Alexis Leon (Associate Editors), 2016. Imagine how much would the National Economy be boosted if an additional 6 crore (60 million) people are able to contribute productively! This Handbook, targeting the MBBS Doctor, or the Nurse in a Primary Healthcare Centre, or anyone interested in working for the disabled, explores the simple steps that could be followed to increase the productivity of the individual, the family, the society and the entire nation. The topics covered include musculo-skeletal disorders, stroke, diabetes, neurogenic bladder, spinal cord injury, hypertension, haemophilia, pressure sores, pulmonary rehabilitation, amputations and many more. A special feature is that professionals, patients, caregivers (and a cartoonist! 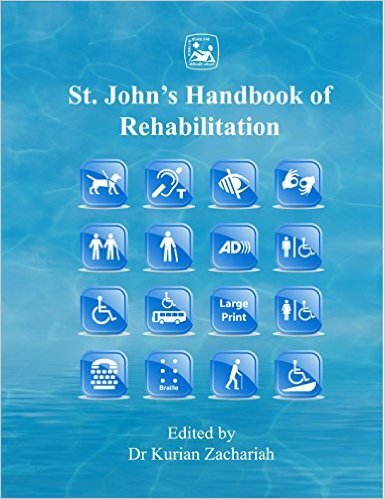 ), have joined hands to co-create the St John’s Handbook of Rehabilitation. The Handbook is focused on “converting resource-burners into resource-earners”.